Right now, there are 65.6 million people around the world who have been forced from their home due to war, persecution or poverty. This means that an estimated 20 people are forcibly displaced every minute. The journeys they make are often extremely dangerous, and many run the risk of being exploited along the way. Once they reach their destination country, whether it be Lebanon, Turkey, or France, they often struggle to gain access to basic services such as healthcare and housing. At Doctors of the World, we aim to provide healthcare for those internally displaced within their own country, for refugees making the journey to build a better future for their families, and in migration hotspots around the world. When people are cut off from healthcare they are often in desperate need of medical experts that we take for granted, such as dentists and gynecologists. In a report we released in November 2017, 14,000 refugee women in Greece reported that medical care had been close to non-existent on their journeys. A refugee is someone who has been forced to leave their home country due to war, fear of being persecuted for their beliefs, or a natural disaster. Of the 65.6 million people who are currently displaced, 22.5 million of them are refugees. The vast majority of refugees come from Syria, Afghanistan, South Sudan and Somalia. 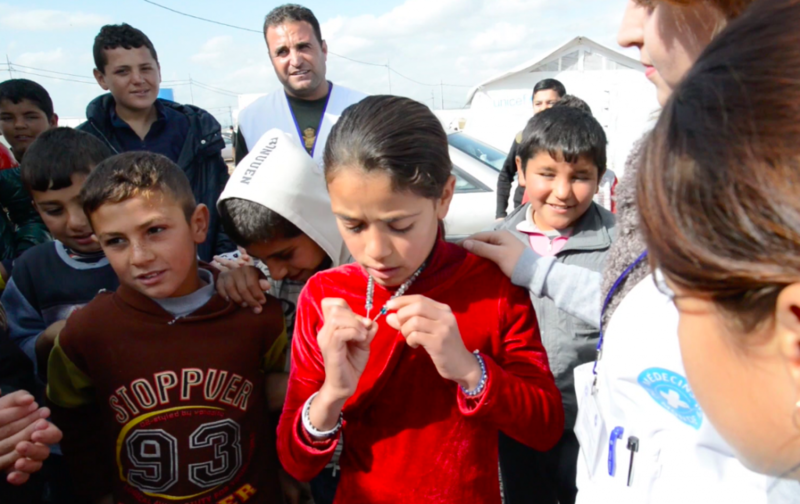 Doctors of the World is committed to improving access to medical care for refugees who’ve had to flee. Refugees have often been through extremely traumatizing experiences, and we work to provide psychological support for those that need it. We deliver our services to the most vulnerable through mobile clinics and health centers set up in refugee camps. An internally displaced person is someone who has had to leave their home but hasn’t crossed an international border. IDPs are often living in substandard housing or refugee camps and have fled violent attacks and military activity. Living in such a precarious position is extremely difficult, especially for families with children. The countries with the most internally displaced populations are Syria, Colombia, and Iraq – all of which have experienced war and significant insecurity in recent years. We provide medical care to IDP populations in all three of these countries and many more including Yemen, Nigeria and Pakistan. That means that 1 in every 30 people is currently an international migrant. As our world becomes increasingly interconnected, millions of people decide to leave their homes every year in search of a better future for themselves and their families. The development of many countries around the world, including the United States, would not have been possible without these migrants. We believe that all people should have equal access to healthcare, regardless of their legal status or financial resources. We also believe that being able to migrate safely should be a right, not a privilege. That’s why along today’s busy migratory routes, including right here in the US, Doctors of the World is working to provide healthcare to those that need it and advocating for their right to access medical attention. We believe that all people should have equal access to healthcare, regardless of their legal status or financial resources. Donate now to help us reach those most in need.